(Toronto, Ont.) The International Wheelchair Basketball Federation (IWBF) and the 2014 Women’s World Wheelchair Basketball Championship (2014WWWBC) organizing committee announced Wednesday the 12 countries that will compete at the largest women’s world championship in history, which takes place June 20-28, 2014 at the Mattamy Athletic Centre in Toronto, Ont. The Canadian Women’s National Team, the defending bronze medallist, will join teams from Australia, Brazil, China, France, Germany, Great Britain, Japan, Mexico, the Netherlands, Peru, and the United States in the tournament. Due to the growth and prosperity of wheelchair basketball worldwide, the women’s tournament will be held separately from the men’s competition for the first time since 1994. The 2014WWWBC is a milestone event that celebrates the ongoing growth of women’s sport, inclusivity and accessibility. 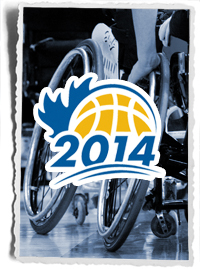 By building on the legacy of hosting the inaugural Women’s U25 World Championship in 2011, and working toward the success of the Toronto 2015 Parapan American Games (TO2015), the organizing committee will forge a legacy for female wheelchair basketball athletes in Canada and around the world. A formal draw will take place at a later date to determine the competition groups for the tournament. The competition schedule will be announced shortly thereafter. Over 400 athletes, coaches, officials, delegates, and volunteers will attend the 2014WWWBC that features 12 participating countries. Canadians can catch a sneak peek at the top 12 female wheelchair basketball players in Canada, including emerging local talent and highly decorated stars, preparing to compete in one of the most fiercely competitive and exciting spectator sports to be played at the Toronto 2015 Parapan American Games and Rio 2016 Paralympic Games. Team Canada is in pursuit of an unprecedented seventh straight podium performance, remarkably, having medalled at every single world championship including the capture of four consecutive gold medals (1994, 1998, 2002, and 2006), and bronze medals in 1990 and 2010. The 2014WWWBC organizing committee is also partnering with Toronto 2015 Parapan American Games to ensure the success of both events. The 2014WWWBC will generate over $4 million in economic activity in Ontario.